In order to specify the “Sunlight” application related input, the user opens a *.sunlight-file in the Sunlight editor shown in the figure on the right hand side. 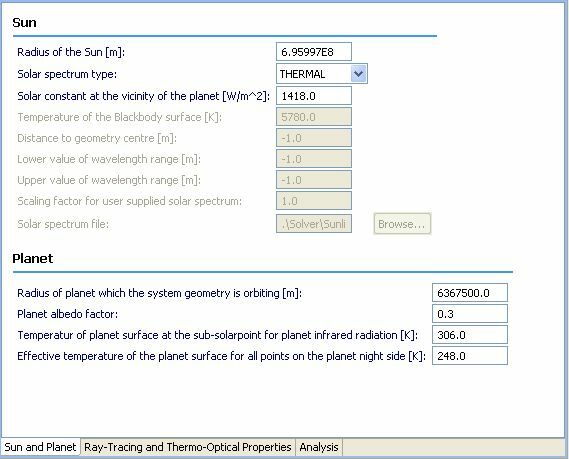 Sun and Planet: parameters for the sun and the planet which the spacecraft is orbiting, in particular the user sets here how solar radiation behaves at the place where it is emitted (sun) and reflected (planet). Ray-Tracing and Thermo-Optical Properties: parameters for ray-tracing and thermo-optical properties. Thermo-optical properties enable Sunlight to consider temperature and wavelength dependencies. Ray-tracing parameters are necessary for the ray-tracing algorithm that is calculating the radiative flux on the geometry. Analysis: definition of the sources of radiation (e.g. direct sun, indirect planet albedo, etc.) and to set output options for the analysis.